Thanks so much, Rebecca! That white thing, I don’t have that. I get excited when I see white. I understand it, but thank God, not had to deal with it. Those Inktense Blocks are perfect tho, if you do, just lay them on the side and go crazy, won’t be blank long! But I have a question for you – should I cut this up and use it as collage fodder in another piece (as it was intended) or keep it whole? Not sure if anyone would buy this? Or if maybe I just need to add more or cover something about it. I don’t know, but once i got the white and black gesso on top at the end, I liked it. Would be curious what your honest opinion (no holes barred) is. Thanks, Steven. Yes, you do. And it really does help. That and yoga! 🙂 Thanks for your comment. Should I cut it or save it? That is the real question! Thank you, Jodi! OK, but I need your honest opinion. Should I cut it up or save it. Would anyone buy this? Otherwise, I will cut it up and use it in something else – since that’s why I made it in the first place. Thanks Margaret! You wouldn’t have said to save it intact would you? I thought you’d be happy I went bigger. Not to say I’ll stay there but….. Yeah I’ve already cut this and made a collage out of part of it. It’ll post Tuesday. I almost forgot draw a bird day is tomorrow. not sure…..what my first reaction was….emotion….angst! but as an intact piece, not sure. It does seem like it was undone and was a bold statement. You ultimately know what you want to do or need to do, art if it is done shouts out that it is complete. This is something that I am wanting to have instilled in me. The confidence and knowing that a piece is done or not. I have to know and feel that, listen to the inner artist that truly knows. Tapping into that is so important, I think that when we do, we are becoming the artist that we really are…..seems like I circled around my words but hopefully you know what I mean. Your instincts are right on, Margaret, this was undone and now that I’ve made something else with part of it, that piece does feel done. And this one will make more. I’m making these 1/4 sheets in different color ways. I see you as such a mature soul and artist. Is it possible that you’re closer than you think to where you wanna be? hmm not sure, it is always hard to picture or see oneself correctly. I always feel ‘undone’ and that is actually good…just being human 🙂 if I have gotten anywhere to be close to what I hope or think I want to be, I have suffered to get there! that is for certain. I have been thinking of working on my Psalm 65 painting and to get real and explore my angst of needing to understand what or where I am going with my art and spiritual journey. I still have insecurity (don’t we all!) with my art and if anything I feel that the intuitive painting and wc has gotten me further than I could ever imagine! Yes I agree. Real growth experiences, both. Oh and the angst is so useful for art. That’s the one thing it’s good for! Purple is my favorite color so I automatically like this. The white swirly things break up the color nicely. Thank you very much. I love purple too and magenta also. Adding white and then later black to this helped it a lot. But it is really nice (IMO) cut into a smaller collaged piece on an almost white ground. Lots of space to break up all of that color. Really glad you liked it! Jill I’m working larger, at least initially lol! The collage I made winds up smaller than 1/4 sheet, but not way. Lots of white space. I hope you’ll like it. It’ll post Tuesday. Looks like the cub in Disney’s The Lion King! well done, going large Laura. using your arm, and shoulder for Expressive Gestures!!! the Color Purple. has interesting interpretations, it makes me Think. and FEEL. as far as ‘cutting it up or leaving it’ goes; i’d leave it for a month. YUP. that long. I’d have another look. reassess. see the GOOD Points!!! then if you were still keen to do some cutting, cropping and reassembling…… at that point in time, Go For It!! But, I would give it a good 4 week resting period beforehand. sometimes…. we jump the gun too early. and change things that in Hindsight, may have been Just Fine left alone. no worries LL! I’m all for ‘creative cropping’!!! all the time, lol around here. Waste not, want not. hehehe I should be able to check people’s blogs now guests have left….. I jsut saw it and loved it!!!!!! Thanks so much, Debi! Found your comments in my spam folder here in WP. Really appreciate your feedback. Please check your spam as my comments have been going in people’s spam lately. I figure it’s God’s way of letting me know I need a break from blogging, etc. thanks again my friend. Thank you. I already have cut it up, since I did create it for collage, figured I’m not in love with it, may as well cut it. It’s all good, I have made a few of these in different color ways and will be sharing soon. Glad you like it. I was glad to be painting large, I think it’s so very different than painting small as I was before. Was it a liberating experience? 🙂 You were so brave to do it. Yes, very! Really enjoyed it. And love the collage that came out of it. I’ve only used less than 1/4 of it so far. It was a great learning experience too. Awwww so sweet. You know Carrie, it’s just paper. It’s just paint. If I were in love with it, I wouldn’t have done it. But the way I approached and created it, easy enough to make another. I’m not brave at all. Hehe. Yay! Going BIG! 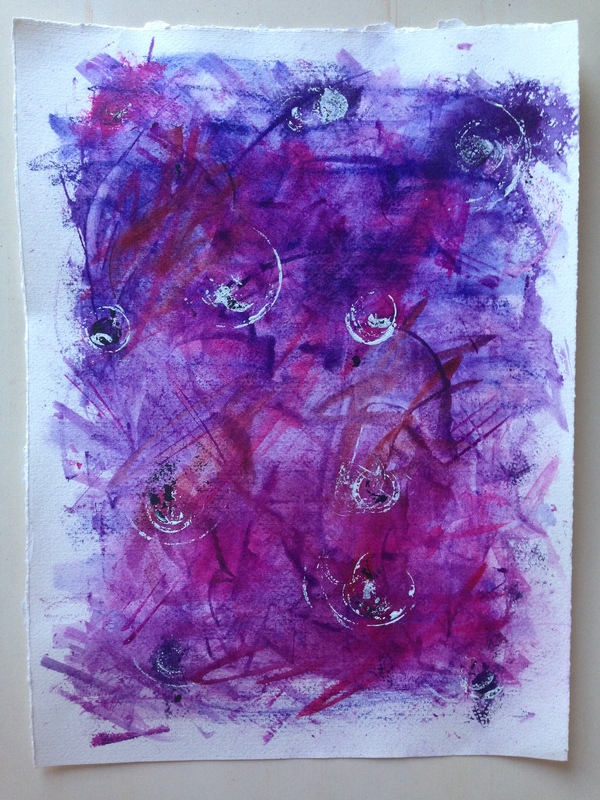 I love seeing the freedom this format created… so much emotion in that beautiful bursting purple! Nice use of space Laura – great to see you going bigger. I like your use of color and the range of values you achieved.